In today’s fast-paced world, where an elevator ride with your CEO can turn into an impromptu meeting, your lunch date can become a job interview, and your conversation at a cocktail party may be a preamble to a potential business merger, knowing how to market yourself in any situation is vital. 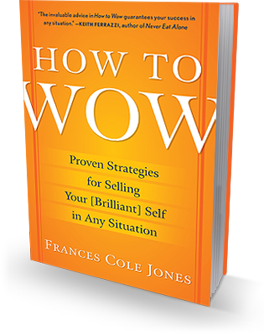 Corporate coach Frances Cole Jones has helped numerous CEOs, celebrities, and public personalities present their best selves on camera and onstage, in boardrooms and in person; now in her new book, How to Wow, she shares her strategies for making your mark in business and in life. Every encounter, Jones believes, provides you with an opportunity to positively influence colleagues, employers, neighbors–even competitors. Not only your words, but your tone of voice and your body language speak volumes. The question, however, is: Are they working together to say what you want them to, as effectively as possible? With easy-to-follow advice, amusing anecdotes, and immediately employable hints, Jones’s guidelines can keep you cool (even in hot water). From asking the right questions to giving the right answers, How to Wow will provide you with the confidence to be calm and commanding in all you do and to wow anyone anywhere anytime. The invaluable advice in How to Wow guarantees your success in any meeting situation, from the boardroom to the breakfast table. Whether you’re sharing an elevator ride with your boss, giving a speech, trying to make the most of an interview opportunity, or preparing a PowerPoint presentation, some strategies will always be beneficial. Corporate coach Frances Cole Jones has built a career on helping CEOs and other public figures present themselves in the most optimal way. In How to Wow, she shares the strategies that can change a quick snack with a colleague into the power lunch you have always craved. Welcome required reading for job hunters.